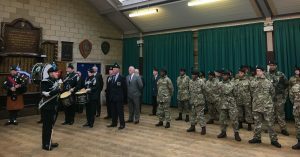 Our cadets share the London Irish Rifles’ historical traditions. Unlike other regiments with an Irish connection, they wear the Caubeen with the badge and accompanying Hackle over the right eye. Cadets and Sergeants wear an “Emerald” green Hackle, and Warrant Officers and Officers wear a “St Patrick’s” blue Hackle. 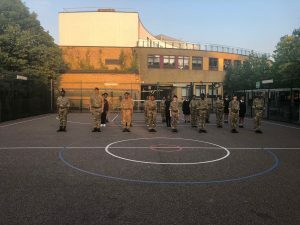 An Army Cadet is expected to learn various subjects of a military nature, and on reaching a certain level in these subjects, cadets can take a test and work towards an arm badge denoting their level of attainment. These are called Star levels and are ranked Recruit, 1, 2, 3 and 4 Star. You can learn more at the the official Army Cadet site. Drill, turnout (wearing the uniform), and military knowledge. Skill at Arms – safe handling of ACF rifles. Shooting – safe target shooting of ACF rifles. Fieldcraft – military manoeuvres in the field. Map & Compass – moving across the countryside with a map & compass. Expeditions – living and walking in the countryside. First Aid – learning and utilising skills of emergency care for injuries or illness. Physical Training – training to be fit to take part in cadet activities. Community Service – helping the community you live in. Click here for SE Sector ACF web page. 71 Cadet Detachment, The London Irish Rifles (South-East sector ACF). TA Centre, 4 Flodden Road, Camberwell, SE5 9LL. 99 Cadet Detachment,The London Irish Rifles (South-East sector ACF). Days : Monday/Wednesday, 730pm to 930pm. Requirements for joining the Army Cadet Force. You should be reasonably fit and healthy, have an interest in outdoor activities, be prepared to learn, be able to accept discipline and be very interested in being part of a team. We will supply you, on loan, with a free uniform for use in cadet activities, which would be returned when you leave the Army Cadet Force. We are also on the lookout for highly motivated, male and female adult staff to help us train our cadets. You do not need to be ex- forces (although it would help) as full training will be given. You should be aged 19 – 35, and reasonably fit. A link to the Army Cadet Force web site can be found by clicking here.